One of the most effective ways of collecting post-sales feedback is to conduct customer surveys. Customer Surveys open a dialogue that not only measures satisfaction rate but also helps enterprises to strengthen customer relationships and build loyalty. Successful businesses understand the underlying value of customer satisfaction. Finding new customers is enough to maintain existing customers. Candidate customer feedback is important because it provides business owners with the necessary knowledge to assess the strengths and weaknesses so that they can improve the practices, products and services. One of the most effective ways of collecting post-sales feedback is to conduct customer surveys. Customer Surveys open a dialogue that not only measures satisfaction rate but also helps enterprises to strengthen customer relationships and build loyalty. 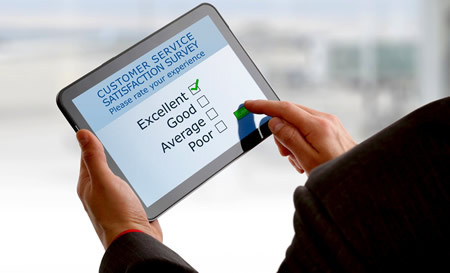 Josoft's customer survey services can often be a labor work for many businesses that help in streamlining. We have a comprehensive online market research expertise and will create, host and administer useful surveys that will provide valuable insight into the needs of B2B market and how well they are being fulfilled. Our customer survey services are an effective tool to attract customers, generate feedback and generate repeat sales that will help you grow your business. We provides operations of all sizes with customized solutions for getting end-user feedback about their products and services. Our customer survey services include survey design, delivery and thorough analysis for benchmarking data. The information gleaned in these surveys allows businesses to identify problems and make necessary revisions before they have a negative impact on sales. We give companies an affordable means to obtain actionable feedback that can be leveraged to improve products, services and the overall customer experience. Many start-up ventures have taken their business to the next level by utilizing customer survey services.